This year, FPInnovations is excited to bring a different kind of event to an industry in transformation. FPInnovates, a new Innovation and Technology Conference, makes its debut in Montreal November 25-26. Open to all, including members and non-members, the conference takes place at the Hyatt Regency hotel in the city’s downtown core. As a recognized innovation leader in forestry research, FPInnovations conceived this event to inform, inspire and change the way we think about innovation and collaboration in the sector. The conference offers a forum where business leaders, researchers, government representatives, academics and students can step outside the box to come together and build a common understanding of innovation and its impact on collaboration. Showcasing the latest technological advances, successes and opportunities, the conference will feature a dynamic mix of speakers and presenters, including innovation experts, industry leaders and world-leading researchers. FPInnovates’ diverse program offers insights on the process of innovation and how your company can innovate better. Make the most of an opportunity to build valuable connections and expand access to the resources you need for collaborative partnerships. Learn about the game-changing innovations that will shape the industry’s future. Take away a fresh perspective on innovation in its many forms and fire up that creative spark! What Do World Class Innovators Do That Others Don’t Do? Jim Carroll, Futurist, Trends, and Innovation expert will set the stage with this keynote address. Through his work with organizations worldwide—from global brands to NASA—Carroll has inspired businesses to reframe the opportunity for innovation amid significant, transformative change. Innovation as a Process will be explored in a session led by Jean Hamel, Vice-President, Pulp, Paper and Bioproducts, FPInnovations, and Peter Lister, Vice-President, Forest Operations and Wood Products. Stepping outside the Box - The Partnering of the Oil and Forest Industries will highlight how the forestry and oil and gas sectors are furthering innovative collaboration. The Next Big Thing: Future Innovations for a Thriving Industry will feature a panel discussion with senior business leaders from the forest sector. Trevor Stuthridge, Executive Vice President, FPInnovations will provide insights on the Impact of FPInnovations’ Strategic Action Plan. The Day 1 sessions will also include a look at Venture Capital’s Role in the Innovation Process; Innovation in the Workforce – Recruitment and Retention; and International Perspectives: A Review of the Scandinavian Innovation Model. Day 2 will feature a session on The Missing Link: Connecting the Innovation and Financial Ecosystems, followed by break-out sessions to identify the top three challenges and present solutions to shape an action plan. The Best Poster Awards will be presented before the closing of the event. The conference fee includes meals and refreshments. Sign up before October 21 and save with the early-bird rate. The Hyatt Regency hotel is also offering a special rate on accommodation until November 13. For more information, visit the FPInnovates website at http://fpinnovates.com. Canada’s vast network of resource roads continues to experience increases in traffic volumes from different sectors every year. Many of these roads, however, were first constructed for accessibility purposes and may have a legacy of substandard alignments, widths, sight distances, and signage. Furthermore, maintaining these legacy roads can also become problematic and expensive. Unsafe road conditions are a large factor in many accidents and fatalities each year. In an effort to improve the safety of resource roads, FPInnovations in 2008 developed a road safety inspection (RSI) service—a systematic approach that aims at assessing road safety through the use of mobile mapping systems (MMS). In practical terms, the RSI performs a systematic, on-site review of an existing road section to identify hazardous conditions that may increase the risk of collisions. It requires a comprehensive and methodical approach to be performed by third party experts with the objective of preventing accidents, rather than responding to them. The RSI methodology that FPInnovations initially developed uses an MMS that is equipped with high precision GPS, cameras, and an inertial measurement unit integrated with LiDAR scanners. The GPS readings inform analysis of curvature radii, the cameras capture information on road width and existing signage, and the LiDAR produces a 3D point cloud model that is later analyzed for obstacles that can produce sight distance issues. After the analysis is complete, the client receives a comprehensive report that can facilitate the prioritization of identified safety improvement recommendations. This RSI approach has always led to excellent results—but its dependence on an array of sophisticated equipment means that the acquisition, post-processing, analysis of collected data, and reporting can range from $200 to $450/km, depending mostly on the length of road mapped. This led FPInnovations’ Resource Road team to search for a more affordable approach, while offering the same quality results. FPInnovations has completed its initial investigation of using photogrammetry to create a 3D point cloud of a road corridor rather than utilizing a LiDAR unit on the MMS to fulfill the same function. Photogrammetry creates a 3D model by analyzing the parallax between sequential images to identify common points, while the alternative LiDAR approach produces points by actively sending out light pulses and recording the returns. 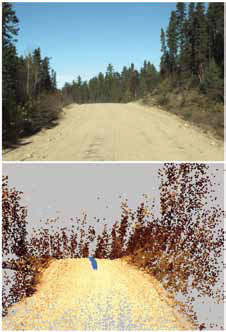 To investigate a photogrammetric approach, FPInnovations performed tests on a selected 20-km long resource road corridor near La Tuque, Quebec. The deployed MMS was similar to that used in previous RSIs, except there was no LiDAR unit. Additionally, the camera took photos at a higher frequency to obtain increased overlap between image sequences. Once the field work was completed, 3D point cloud model production was tested using several commercially available photogrammetry software packages. The tests led to the successful creation of a point cloud model along the entire 20 km road corridor. Although some sections did not have as many points as LiDAR would have provided, the resulting point cloud still had sufficient density for RSI purposes. Since beginning its RSI initiative, FPInnovations has scanned more than 1,000 km of resource roads and delivered detailed reports for numerous road networks, with post-road upgrade assessments showing positive feedback. Now, the confirmation that a photogrammetry-based approach can provide point clouds with sufficient quality in a resource road setting adds to FPInnovations repertoire of RSI options to its customers. It is anticipated that a photogrammetry-based RSI will reduce costs by up to 40 per cent compared to the established LiDAR approach. But ultimately, a more affordable RSI solution can benefit all the drivers travelling on resource roads. FPInnovations would like to acknowledge Natural Resources Canada for funding this research. For further information about FPInnovations’ Road Safety Inspection service, please contact Matt Kurowski (Matt.Kurowski@fpinnovations.ca) or Glen Legere (Glen.Legere@fpinnovations.ca). In Western Canada, there are significant volumes of timber that are growing on slopes greater than 30 per cent. With the decrease in fibre supply resulting from the mountain pine beetle epidemic, the industry in this region needs to access more timber from steep terrain. 3. Provide an additional sustainable volume of 2 million m³ from steep terrain. To achieve these aspirational objectives, FPInnovations will step up its research efforts in its harvesting, resource roads and transportation programs. There will also be extensive liaison with international partners since many regions of the world including New Zealand, and countries in South America and Europe, are also actively engaged in developing and testing new technology for harvesting in steep terrain. The focus in the initial stages of the initiative will be on technology assessments and gradual implementation in western Canadian operations, along with collaboration with equipment manufacturers and safety agencies to ensure that the innovations considered will have a positive impact on the safety record of the industry. In the medium term, FPInnovations will also aim to foster the development of domestically-produced technologies and work with government partners to ensure that environmentally-acceptable best practices are used in harvesting, road construction and regeneration. For further information on the steep slope initiative, please contact Jim Hunt at james.hunt@fpinnovations.ca. Application review is now underway for all funding areas of the Alberta Bio Future (ABF) program offered by Alberta Innovates Bio Solutions (AI Bio). ABF’s goal is to help accelerate growth in Alberta’s bioindustrial sector. It is co-funded by AI Bio, a provincial funding agency, and the Alberta Ministry of Innovation and Advanced Education. A total of $20 million has been dedicated to this program until 2019. “Biomass is a very valuable resource that can feed a number of new products and bioindustrial technologies in Alberta,” says Dr. Christine Murray, AI Bio’s lead director responsible for ABF program implementation. “It can be an underutilized resource with a lot of value, and it is very often a byproduct in many processing technologies.” Many biomass sources can provide a stream of feedstock for new products and new technologies. The ABF program has three components: Research and Innovation, Equipment Utilization, and Product and Technology Commercialization. There has been strong interest in the ABF program since it was launched last spring—AI Bio received 44 proposals from Alberta companies under its Product and Technology Commercialization component, including many involving forest biomass. While the window for funding requests under two of the three ABF programs is now closed, there are still opportunities to apply for Equipment Utilization funding since this program has continuous intake. AI Bio reviews these applications quarterly. The next review will begin December 10, 2015. Murray emphasizes that this component is not for R & D, but for development work that is moving forward, for companies that already have done some lab bench work and are ready to move to a larger scale. This program opens the doors to Alberta’s many public facilities with fibre-processing equipment and technical expertise, and for the creation of partnerships with companies to achieve scale-up or pilot development of their bioindustrial products or technologies. AI Bio’s call for research and innovation proposals closed October 28, 2015. “Our hope is that we have received research project proposals with clearly articulated benefits to Alberta—wherever they are along the research continuum—and that those projects are well developed with a multi-disciplinary approach,” says Murray. The ABF Research and Innovation (R&I) program has $4.5 million in available funding. Its focus is on developing bioindustrial products and technologies using biomass. There is a focus particularly in the categories of biomaterials, biochemicals, and biomass characterization (documentation of important and useful properties) for the development of bioproducts that could be used in a wide range of industries. Project activities will include basic or applied research, or pre-commercial development. Information on biomass characterization developed by projects funded under the ABF program will be made publicly available to advance the bioindustrial sector. Murray expects that many of the R & I projects will have three- to four-year time horizons, and successful applicants are being strongly encouraged to leverage ABF funding with other potential funding sources from both the public and private sectors. In terms of the amount of research already underway within the bioindustrial sector in the province, Murray says that depends on the area of development. While research is well advanced in some areas such as the development of biochemicals, there seems to be a need for more work in the area of biomass characterization. The impact that proposed research and innovation projects could have on reducing the province’s carbon footprint is part of the evaluation process. “The importance of products that reduce our carbon footprint is being valued as part of the project evaluation,” says Murray. The ABF Research and Innovation program is supporting both new research and ongoing research with no specific funding allocation for each. All proposals are being considered on their merit. 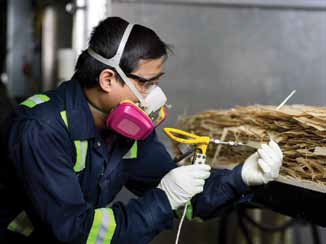 Companies can apply for funding under the Equipment Utilization component of the Alberta Bio Future program, and gain access to the wood processing equipment and technical expertise at the AITF lab in Edmonton. For more information about AI Bio’s Alberta Bio Future (ABF) program, visit http://bio.albertainnovates.ca/funding/abf/ or call (780) 427-1956. For information on equipment eligible for funding, visit http://www.albertatechfutures.ca/RDSupport/BioandIndustrialTechnologies/BioIndustrialTechnologiesandServices.aspx and http://www1.agric.gov.ab.ca/$Department/deptdocs.nsf/all/bt15028. 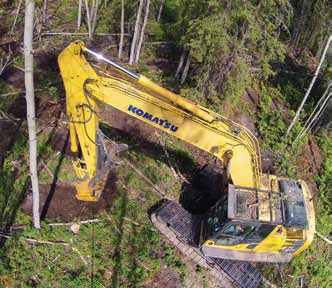 Silviculture and Afforestation Innovation Group demostrates two proven site rehabilitation tools. 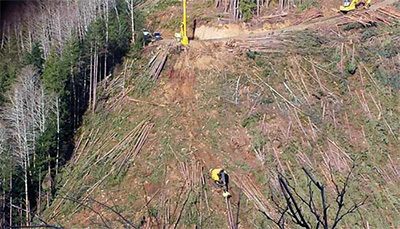 The Silviculture and Afforestation Innovation Group (SAIG) is demonstrating various site rehabilitation techniques and tools to bring a variety of previously productive forest lands—like beetle-infected stands as well as sites disturbed for other land uses—back onto a successful commercial forest recovery trajectory. Two of the tools being demonstrated are the Meri Crusher and the Grizz mounted on an excavator. Growth response on research sites where these tools have been deployed show as much as a 20 per cent increase in seedling survival and 25 per cent increase in establishment growth for tolerant softwoods. Below is a photo representation of each tool working in the field and a description of their use and objectives. This commercially available tool was originally designed as a cultivation tool and works similar to a rototiller. It consists of high strength, bullet-shaped, carbon-tipped teeth on a horizontal drum that spins at 500 to 700 rpm. It has the ability to operate on forest sites with variable ground surface density that may include roots, various soils and stones. The tool mixes litter and humic layers, as well as the upper mineral soil on undisturbed or disturbed forest sites, creating horizontal micro-sites on moderate to well drained sites for softwood regeneration. Equipped with a quick attach and hydraulic system suited for forest conditions, it requires 35 to 40 dedicated hydraulic horsepower on the prime mover to operate the tool. 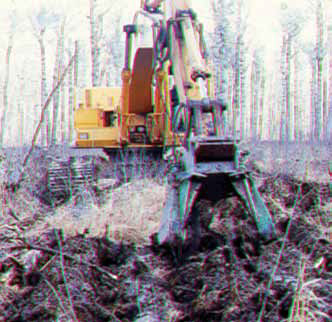 Attached to a prime mover such as a 200 or 250 series excavator, it can reach in to prepare micro-sites for seedlings. The tool mixes down 15 to 20 cms (6 to 8 in) and creates a 1.2 metre wide bed, with multiple tree planting options, depending on the length of the micro-site bed. An experienced operator can create 140 to 200 micro-sites per hour, with planting possible immediately after preparation. 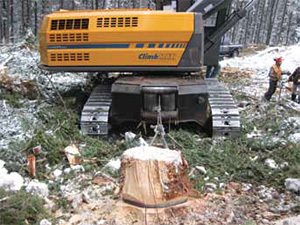 Price for the tool adapted for this forestry application is $25,000 to $30,000. This tool controls competition, enhances the growing environment of seedlings that is very easy to plant. The Grizz is a mixing tool developed and patented by the Government of Canada that creates an elevated bed mix similar to a potato planting hill. It takes the organics and undisturbed mineral soil and mixes it up from the outside edge of the disturbance, tossing it toward the centre, using two aggressive disks powered by two hydraulic radial piston motors. The hydraulically powered discs rotate at 20 to 30 rpm and require 40 to 50 horsepower to drive the head. It creates an elevated bed that is 0.6 to 0.9 metres in width, allowing for good moisture management. It can be used on sites with good and poor drainage. The Grizz tool can be deployed attached as a single head to a 200 to 250 series excavator to create individual micro-sites 1.5 to 3.5 metres long. Canadian service suppliers are available to build Grizz attachments, with the cost estimated at $35,000. The patent has expired on this tool design. This tool creates an elevated micro-site which controls competition and enhances the growing environment of seedlings. For more information about these tools, contact Derek Sidders at (780) 435-7355 or by e-mail at Derek.Sidders@nrcan.gc.ca.